All indications point to a couple of days w/o rain! Now that’s a good thing. There will be cart restrictions in place…at least on Saturday. We’ll be keeping a close eye on the course, and if at some point during the day the fairways are drying to the point where turf damage will be minimal…then obviously we’ll remove the cartpath only restriction. The excessive amount of rain and humidity has caused a rapid acceleration in turf growth. We’ve double-cut and rolled greens the past two days (normally, something I prefer not to do when putting surfaces are sooo soft), and still have had a hard time getting green speeds above 10 ft. We’ll continue these practices right through the weekend with the hope of achieving not only good speeds…but more importantly, a good/true roll. Fairways will be mowed this morning and hopefully (weather permitting), the next several mornings as growth is at a peak rate due to all the moisture. Bunker maintenance has required an extreme amount of man-hours this week, and this morning we plan to cultivate/rake the sand to minimize compaction (“hardness”). 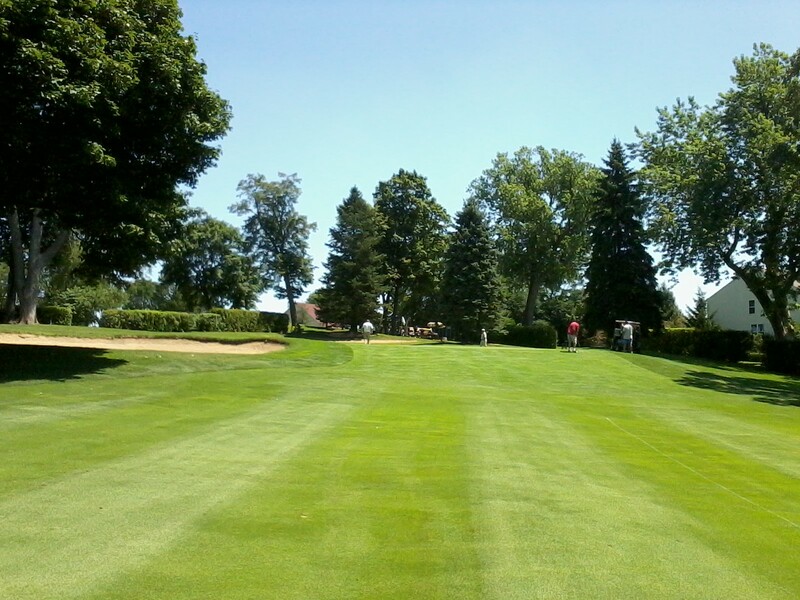 The Hilldale Men’s Club has their two-day member/member event this weekend, so good luck to them and I hope all regular players and guests enjoy the golf course and find conditions to their liking. The picture below is from earlier in the week when the Evanston Firefighters had their annual outing. This entry was posted on Saturday, July 30th, 2011 at 9:41 am and is filed under Uncategorized. You can follow any responses to this entry through the RSS 2.0 feed. You can leave a response, or trackback from your own site.